Carla Mazefsky got hooked in college. She was looking for work when she spotted a flier about an 8-year-old boy with big blue eyes. "Do you want to help make a miracle?" the flier asked. It was hard to resist. When she called the number listed, she learned that the child had autism, and his family wanted someone to teach him. She took the job, where she taught him skills using an autism therapy called Applied Behavior Analysis. He learned to answer yes or no questions, and take a walk around the block without darting into the street, small miracles all. She already knew she wanted to be a psychologist, but this job opened a door. She began working with other children with autism and getting to know their families. "I was moved by their stories and their struggles, and it made me want to dedicate my time to improving their world," she said. And that she did. She earned a doctorate in clinical psychology in 2005, joined the faculty at University of Pittsburgh School of Medicine, and became a top investigator with the Autism Inpatient Collection (AIC) project. The U.S.-based project aims to learn more about youth, ages 4 to 20, who are admitted to six in-patient psychiatry units that specialize in autism. Dr. Mazefsky hopes the AIC will lead to better treatments for people with autism and severe behavior problems. "Often these are the very individuals who are not included in other research studies and large genetic collections because it may be difficult to work with them because of their behaviors," she said. "We can safely involve them and work with them in the inpatient units." As a result, autism studies can include "the full range of people affected by autism, including the severely-affected." 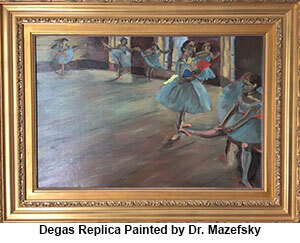 Dr. Mazefsky's path to researching severe autism was not a straight one. At 18, she left her home in Connecticut to study at an art school in the Flemish part of Belgium, home of great masters such as Rubens. There, she developed her love of painting in oil, and a proficiency in speaking Dutch. But she put her paintbrush down and headed to Virginia, where she studied psychology at the College of William and Mary. Then came graduate studies at Virginia Commonwealth University. While studying for her doctorate, she considered specializing in forensic psychology. She worked with a police SWAT team, and consumed episodes of the popular television drama, CSI: Crime Scene Investigation. She seemed like a good candidate for the university's violence prevention program. But something about autism drew her back. She began working with teenagers with autism spectrum disorder (ASD) who struggled with anxiety and depression. "They had difficulty in getting through a school day without breaking down," she recalled. A mentor, Professor Donald Oswald PhD, remembered her work in the university autism clinic. "I recall one boy with Asperger Syndrome whom she saw in therapy; our supervision sessions on that case were always fascinating as she learned to know and appreciate this amazing and quirky young man." Those experiences contributed to her interest in researching "emotion dysregulation," a common problem in autism.1 That term may sound new, but one result of dysregulation has a more well-known name: "meltdowns." What is emotion dysregulation in autism? "For some people it includes behaviors like yelling, arguing, hurting someone else or themselves, or destroying things," Dr. Mazefsky said. "For other people, they might feel it more inside, such as constantly feeling sad or nervous. And that might be less obvious to other people; the person feeling it might not be aware of it or know what to call it." People with this problem become distressed easily and quickly, and react impulsively. "Often parents will describe their child as going from 0 to 100 instantly." Once upset, the person will get stuck and be unable to calm down. Trouble managing one's emotions can interfere with success in different aspects of life, including the workplace, she said. For example, some adults with autism graduate college, and "everything is in the cards for them to do well. But they get into the job scene, and they're having arguments or melting down. That gets in the way," she said. Much of the research into emotion dysregulation in autism, including her own, focuses on people who speak and do not have intellectual disability. But that's largely because the tools used to measure emotional issues generally require the patient to be able to speak. She and other AIC researchers want to change that. They are developing a questionnaire to measure emotional dysregulation regardless of the person's ability to speak fluently.2 Such research would enable clinicians to help people on all parts of the spectrum understand their emotions and manage their responses better. The AIC project offered an "amazing opportunity to extend my work to the people who are less verbal and to work with those who are struggling the most emotionally and behaviorally," she said. It is those struggles that particularly define the AIC, she explained. "For better or for worse, the term 'severely affected' has been used to describe the AIC because, on average, our population has a higher rate of intellectual disability and more minimally-verbal or nonverbal people than other research projects. But the term was also meant to capture the severe psychiatric and behavioral problems of the youth in our study, even youth in the high-average range of IQ." In fact, youth in the AIC have intelligence quotients (IQs) across the entire spectrum, from very low, in the 30s, to extremely high, at 140. As part of the AIC, she also is working on concrete ways to help people manage emotions and improve their safety. For examples, AIC researchers want to develop a wearable device that would predict when someone might hit themselves or others, or have a meltdown. The device (somewhat like a fitness tracker) would have to accurately measure the physical changes that occur right before an outburst, or severe behavior. Such changes could be to a person's heart rate, sweat output, or other factors. This device would give caregivers, and the person with autism, a way of predicting and possibly preventing an outburst before it occurs, she said. Research, and finding ways to improve the lives of people with autism, keeps her busy. Her research has been published in several dozen peer-reviewed journals, often as the lead author. But that's work. At home, she has three other important reasons to stay busy. She has three children between the ages of 3 and 8, and ferries them to field and ice hockey practices, swim meets, and other activities. There is, she said, no time in her schedule for oil painting, at least not now. Photo credits: 1) University of Pittsburgh School of Medicine; 2) and 3) Dr. Mazefsky. Mazefsky CA, Herrington J, Siegel M, et al. The role of emotion regulation in autism spectrum disorder RH: Emotion regulation in ASD. J Am Acad Child Adolesc Psychiatry. 2013;52(7):679-688. Article. Mazefsky CA, Day TN, Siegel M, et al. Development of the emotion dysregulation inventory: A PROMIS(R)ing method for creating sensitive and unbiased questionnaires for autism spectrum disorder. J Autism Dev Disord. 2016. Abstract.